By monitoring your website 24/7, we are able to see exactly when an update for a plugin or theme is required. Or when an update for Wordpress Core is necessary. If there’s any attempts to hack or fraud login to your site, we’ll know about it instantly and get the blocks in to stop any unlawful login. It’s very important to update WordPress, both for the security of your website and to take advantage of the latest features and improvements WordPress offers. Updates to WordPress core and any plugins or themes installed on your website can happen pretty frequently. Keeping them all updated takes time with frequent logins to maintain your website updates. If you haven’t the time or expertise, then you need to take advantage of our WordPress Maintenance Service. Why Should I Get WordPress Maintenance Service? By keeping your website WordPress core, themes and plugins up to date, you’re keeping the hackers out and securing your website from attacks. Keeping the hackers out keeps your website content safe and secure. It’s important to update WordPress, both for the security of your site and to take advantage of the latest features and improvements. By staying up to date with all your websites plugins, themes and so on, you can make your website faster, display better. We will know immediately if your website goes down, for whatever reason. If that happens, we can be working a solution to restore your website within minutes. How Much Does WordPress Maintenance Service Cost? There is a yearly fee, $60AUD. For this fee, you get piece of mind that your online website is monitored 24/7 for updates and any faults that may occur. If there are faults, we’ll sort them out for you within 24 hours. That’s just $5 per month. Now that’s value added. If you don’t like our service then you can cancel anytime. It’s completely up to you. One click and you’re done. What Features or Benefits Does WPM Service Have? Our WPM Service reports include all update actions made to your WordPress core, theme & plugins within a certain time-frame, both from the WPM Service dashboard and the your WordPress dashboard. We view the average response times and a list of countries with up time performance based on real data from actual visits to your site. We then add this information into your monthly reports. Yes. WPM Service uses industry standard SSL technology to encrypt your site details and only allows access from the accounts you authenticate. WPM Service’s SEO Checker feature integrates with the Yoast SEO Plugin so you can quickly see the SEO status of the content on your WordPress website. 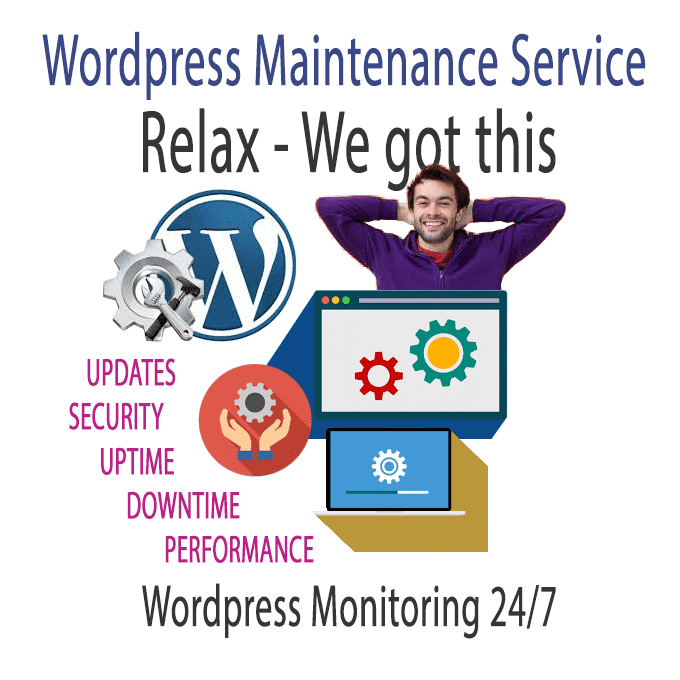 Why WordPress maintenance service? WordPress usually rolls out major updates 2 to 4 times a year, though minor updates roll out as needed. There are also updates for themes and plugins, which are much less predictable. If you can’t keep up or haven’t the time to keep on top of these updates, then we can do that for you. It’s very important to keep your website safe & secure. Keeping on top of updates for your website will make your website less hack-able. WPM Service is an easy way to manage updates for your WordPress site/s. Instead of logging in to your site everyday to check for updates individually, we take care of that for you and install available updates, making your WordPress maintenance service easy. Manage updates + uptime monitoring from one convenient dashboard. We can send (if you’d like) Site up/down notification emails. We also have the ability to track response times from multiple global locations and notify you if there’s any problems or issues. We generate and email you your WordPress Maintenance Service reports as part of your monthly maintenance service. Sometimes you don’t always need to see every menu item that WordPress offers. We can hide items that you don’t want to touch, like certain plugin menus or settings. We will know immediately if one of your sites goes down. We can manage your WordPress site updates and uptime monitoring all from one place with Uptime Monitoring. Get an overview of important site metrics with WPM Service WordPress Google Analytics integration — all from your Service dashboard. Track keywords, SEO score and SEO Readability for all your WordPress sites. We can view a list of your latest posts and tweet directly from the WPM Service dashboard with WordPress social sharing. We manage all your WordPress site updates and uptime monitoring all from one place. Save yourself the hassle of multiple logins and accounts! WPM Service views the average response times and a list of countries with uptime performance based on real data from actual visits to your site. WPM Service offers a ton of time-saving features designed for anyone managing their own WordPress site. WPM Service includes all syncing standard features + up time monitoring, maintenance reports for clients, client dashboard, social sharing and more.